Is the Racket causing havoc? Now that the sun is shining a little longer, some of us are drawn to be outside. Some of us become weekend warriors while others are picking up a hobby that your body is not ready for. I played tennis this spring for the first time in 20 years with a recreational tennis league for doubles. Since it had been 20 years from the last time I held a racket, my mind was screaming you are not ready for this. Holding a racket and coming in contact with a speeding object gave concern for my arm and shoulder. The thrill of being on the court again washed my concern away. 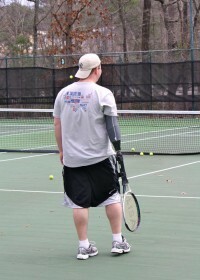 I survived 10 weeks of play which felt great to move in the motion that body is supposed to move. There will be some that have hit the outdoors and are not so lucky. One of the most common elbow injuries is that of tennis elbow. However, tennis elbow can be very common in individuals who never play racket sports. When you look closer to the anatomy of the elbow you see that it is primarily responsible for movements that grip and lift. If we ponder how many times a day you are using your hands, wrist and elbows the number would reach infinity. Some examples of movement are opening bottles of water, twisting, squeezing, lifting, writing and so on. The muscle tendon at the elbow becomes inflamed. This inflammation can occur quickly and the pain can be disabling. Treatment can be numerous rehabilitative exercises, anti-inflammatory medications, splinting of the elbow, massage therapy and above all rest. Prevention is the key with any new exercise, sport or weekend endeavor. Make sure that you do some warm up exercises if you are a racket user. If you are not playing a sport and are having issues from daily activity then allow yourself a break from repetitive movements. Hydrate your body by drinking water and enjoy pounding the great outdoors. Be mindful in your play, your body will thank you later.